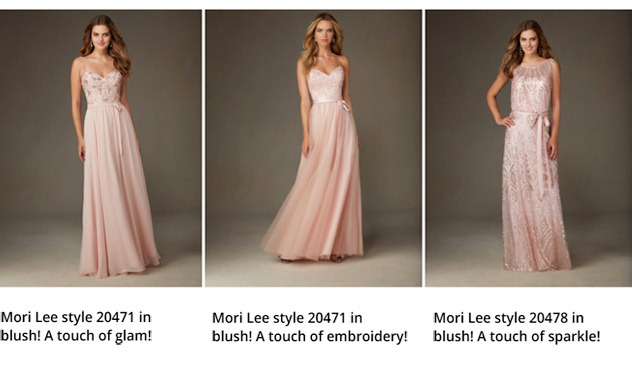 One of our favourite themes for the current and the forthcoming 2017 spring/summer collection for themes, décor and bridesmaids is everything BLUSH! We adore the soft, pretty and warmth of the blush tones. Perfect for a neutral/pastel shades! Top image: Eliza and Ethan wrap dress in dusty rose! So versatile and elegant! If only it was peony season all year round! This is where soft blush roses come in perfectly, add some lilies and crystals, for that perfect blush look! 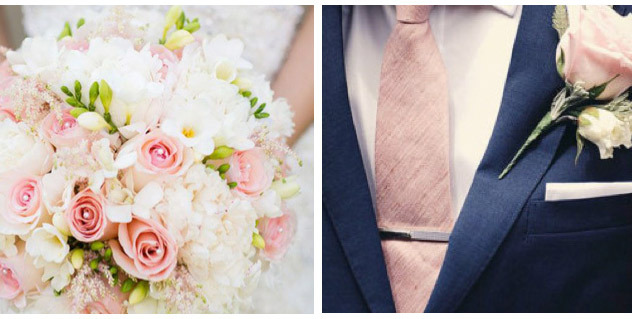 Add a touch of blush to compliment the bridesmaids and bouquets onto the men’s cravats. This can be either with a delicate blush flower in the pockets, soft blush ties or even blush shirts. Also, a navy suit compliments blush perfectly! The blush colour scheme fits hand in hand with the vintage/glamour theme. Add some pretty vintage details to compliment this warm and soft look. The blush pink colour is perfect for weddings all year round. It is one of the top sellers for bridesmaid’s colours and is so pretty yet vintage!